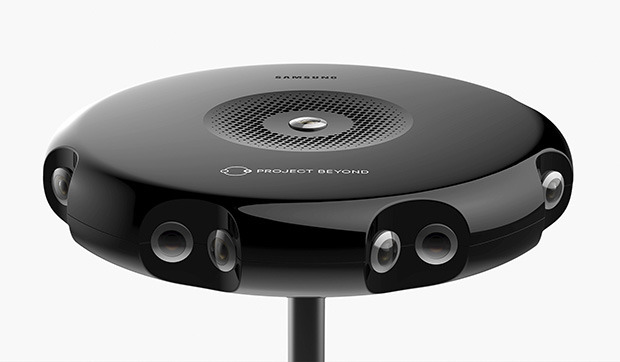 Troubled South Korean smartphone maker Samsung will reveal the next iteration of its Galaxy smartphone lineup later this month, and will reportedly accompany the new handsets with a 360-degree virtual reality camera. The Gear 360 will use two 180-degree fisheye lenses to capture full-circle video at resolutions up to 3,840-pixels-by-1,920-pixels. It’s said to pack a battery and storage onboard for standalone operation, though users should have the option to view the feed in realtime on their Samsung smartphone. As for the new handsets, the Galaxy S7 is likely to ship with either Qualcomm’s Snapdragon 820 or Samsung’s Exynos 8890 — depending on the region and variant — and 4 gigabytes of RAM. A 12-megapixel rear camera would accompany a 5-megapixel wide-angle “selfie cam,” and buyers should once again have access to a MicroSD slot. After relatively disappointing sales for the Galaxy S6, Samsung is banking on the S7 and S7 Edge to spark a turnaround in its mobile business. Last month, the company cited “a difficult business environment” when announcing a 40 percent year-over-year drop in net profit. Samsung’s “Galaxy Unpacked 2016” event will be held on Feb. 21 in Barcelona.